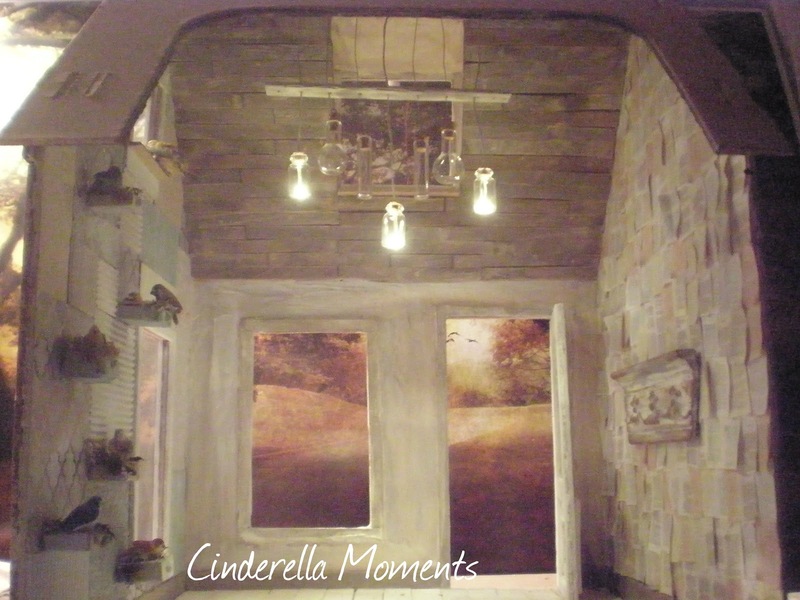 Cinderella Moments: Onto Anthropologie Dollhouse! This is the new project! Anthropologie Dollhouse. I just got back from the beach just itching to work on this house. It was Christmas at the beach for me and Lizzie. 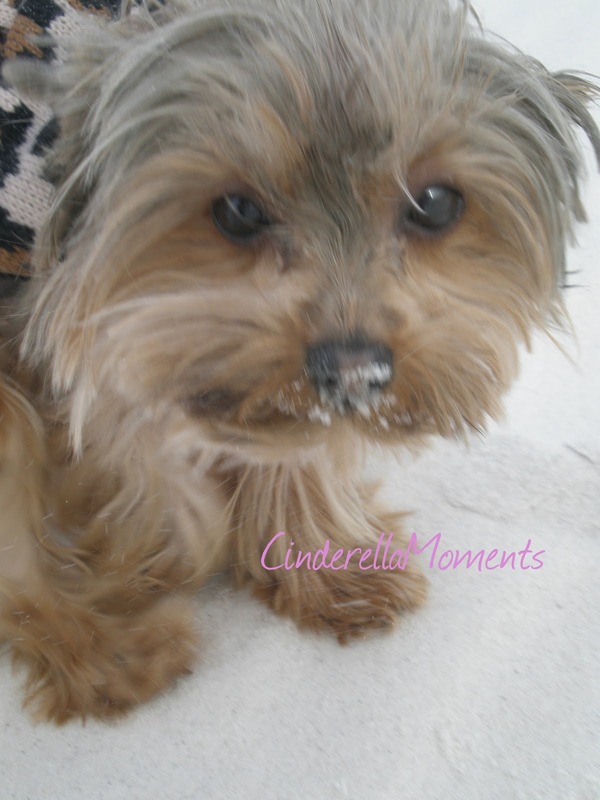 Lizzie had plenty of fun digging in the sand! Now back to my new project. 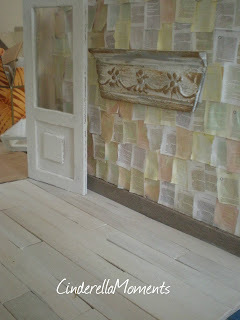 I'm doing an Anthropologie inspired dollhouse. Anthropologie, for those of you not familiar with it, is a very eclectic, romantic and artsy store. They are renowned for their fantastic display windows. Google Anthropologie and you'll see exactly what I mean. I'm so happy with how the interior is turning out! It's one of those projects that I just couldn't wait to do the inside first. 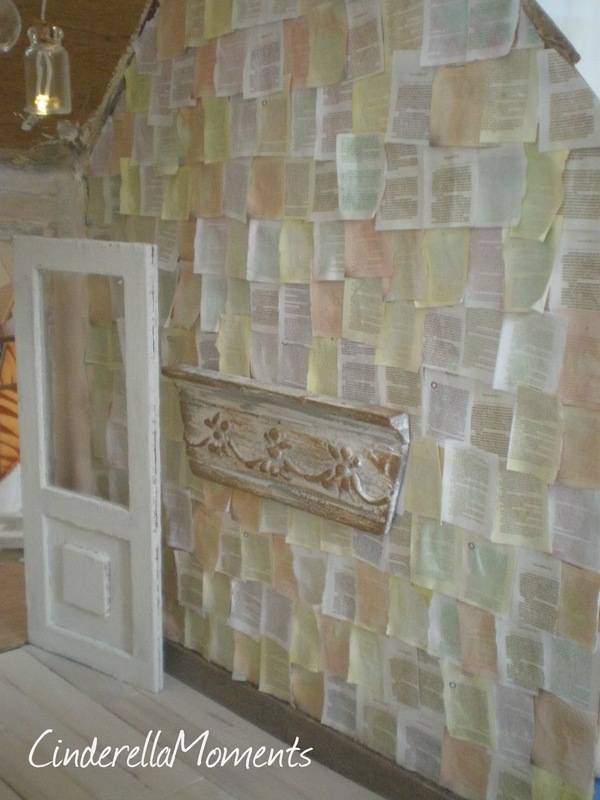 My first idea was a wall of book pages. I just wait online and found a few different images of script. It doesn't matter what they say. You won't be able to make out the writing. Then I used Pixlr.com to get different tints and aged finishes on each page. I wet the edges of each sheet by dipping my finger in water. Then applied a little glue to the middle of the page and started my wall. 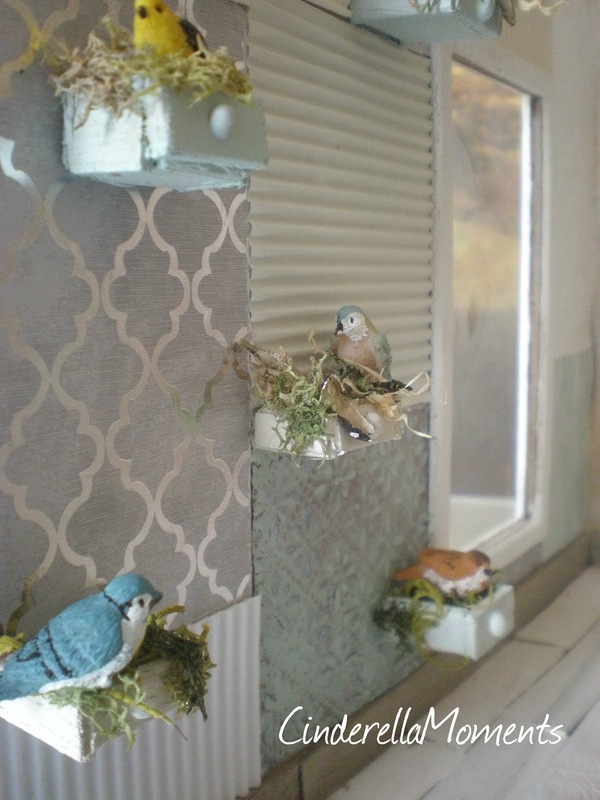 My next idea was this bird wall. I started off with scrapbook paper bits all in the same tones: cream, white, gray, light mint, light robin egg blue. They're all textured differently. Then I wanted to include birds. 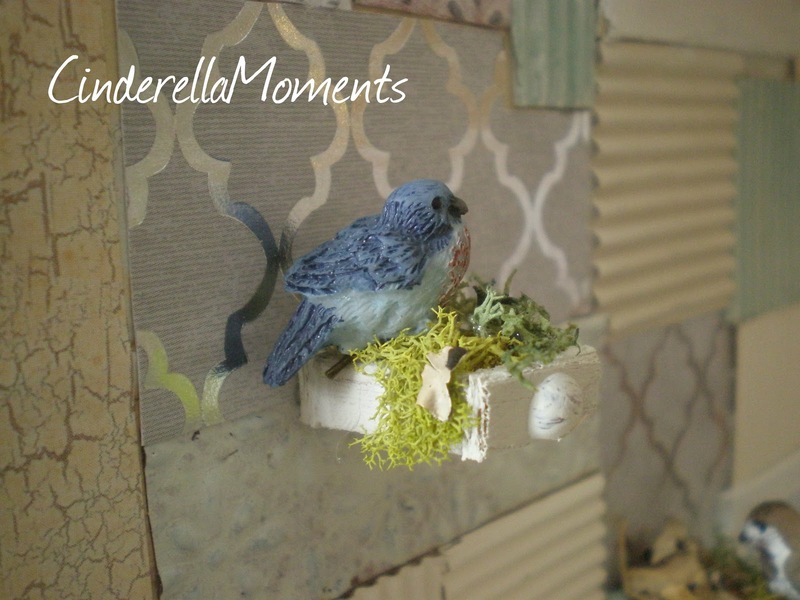 So I made each little bird a little nest inside of a drawer. The drawers are just wood pieces I had left over. I glued 4 sides to a bottom piece. The drawer pull is a bead of hot glue. This bird is on the top window ledge. This is how it looks from outside. Too sweet right? I had to have a jar chandelier! So I made this one. 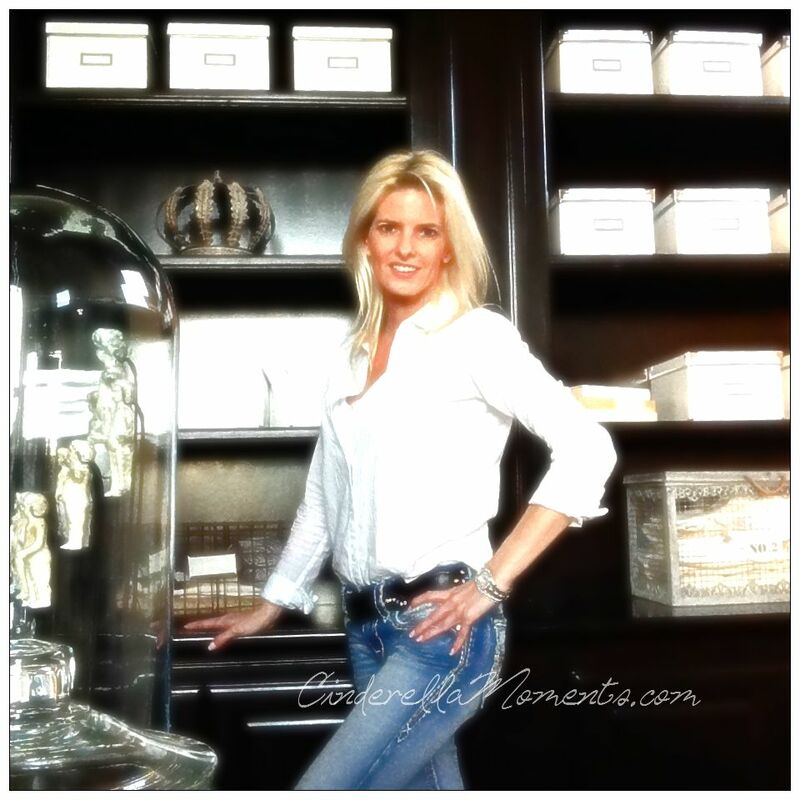 I kept it uncluttered and more modern by lining the jars up in a row. Only 3 jars have a light. I want the light to be soft. If they all had a bulb it would be way too bright! 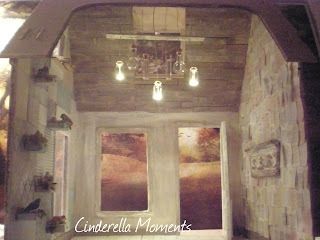 I decided to cover the ceiling with narrow planks(Popsicle sticks). I added a little color to the ceiling. This is a mix of brown, a little black and a lot of water. The grain of the wood shows through because the mixture is so thin. The look you get is an aged barn wood. The floor is wide wood planks(large tongue depressors/craft sticks). Come back to see how it turns out. I'm off tomorrow for 5 weeks at our New Zealand cottage which doesn't have an internet connection but I'll pop by to see the updates when I go into the city from time to time. Sounds like you had a Merry Christmas with your family I am assuming........loved the beach shot, brought back memories of when I was a kid living up there. You are off to a great start! That store snags me all the time. :D I have some of their clothing and home goods...just bought myself a couple of kitchen things from there while Christmas shopping. Wat een bijzonder huis. Je vogeltjes zijn prachtig. Gezond en creatief 2013 gewenst. Tu perrita Lizzie, es preciosa, que bonitas fotos de la playa ! El nuevo proyeto me encanta, muy moderno!! 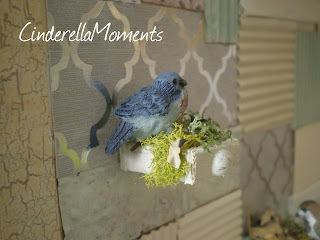 Caroline this style is great: birdies and anthropologie is a great combination! The house is absolutely beaytiful so far :D! Me ha encantado el reportaje que has hecho, estoy deseando ver más. Feliz Año Nuevo. 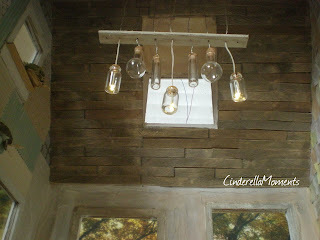 Oh my goodness, the little bottles hanging from the ceiling are just too precious for words!!! Love it! I like your interesting new project. The wall with the birds is enchanting. I'm curious to see more. Wow Caroline this house is stunning I love it. 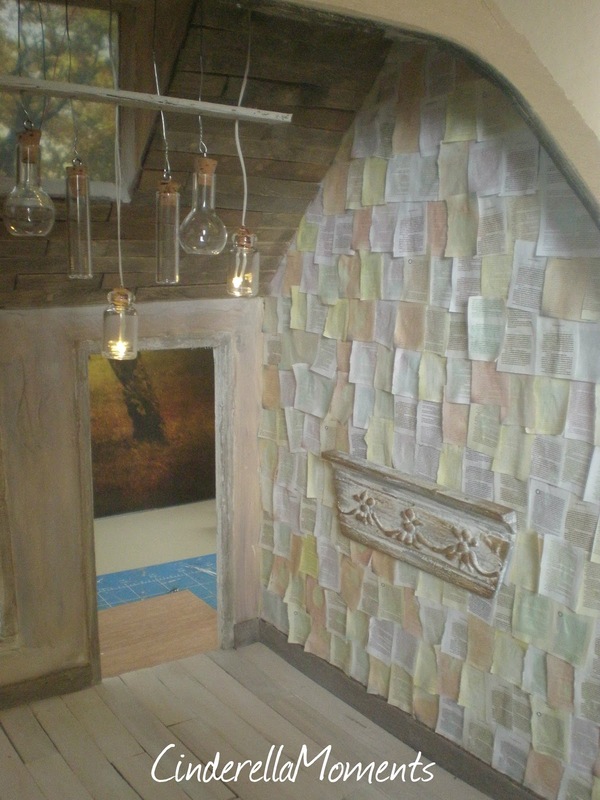 Well I love all your houses :D but this one is so different the bird wall is amazing wonderful work and there is more ? wow. Wishing you and yours a Happy 2013 may all your wishes come true. Exciting project. 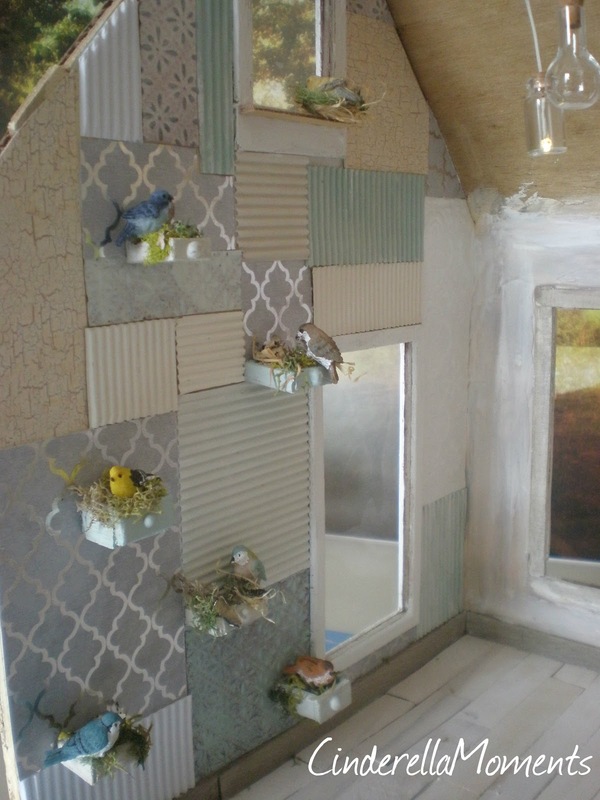 I love your bird wall. 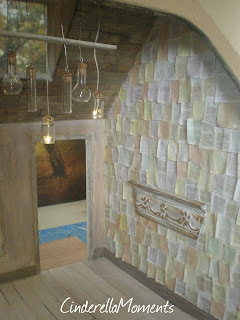 The fact that you have used different materials on the wall gives a special effect. Your letter wall is a fun idea. I look forward to seeing more. Lovely beach you get your inspiration. Caroline, que hermosas fotos de la playa, me imagino que se la pasaron muy bien!! Me encanta la nueva casa con esos detalles y estoy ansiosa de ver mas. fantastic...it looks like you have so much fun with your work. Can't wait to see how it turns out! What an interesting and exciting project! I love the birds. I can't wait to see more... Lucky you having been able to go to the beach! This is incredible, EXACTLY like Anthropologe! I have been collecting ideas on my Pinterest board for something among this vein. 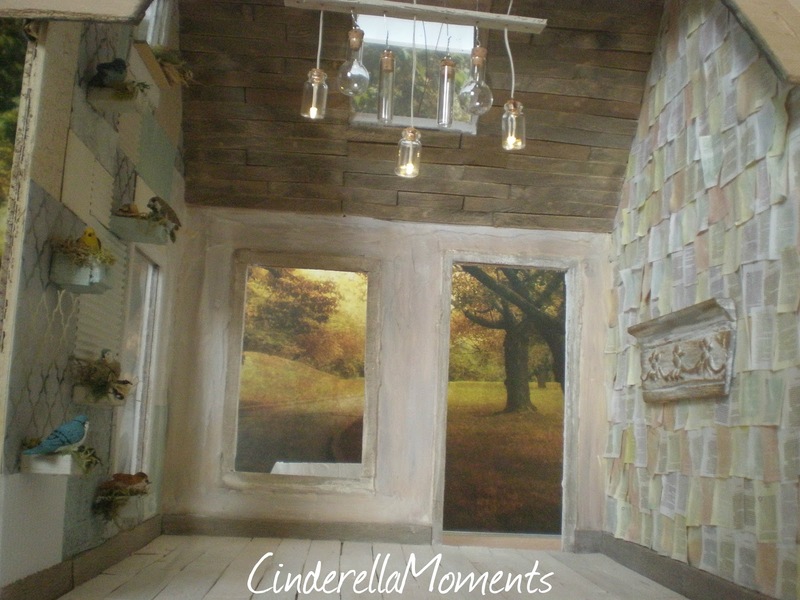 I am not starting my project until after the floor in my craft room/office is redone (a month? 2?) 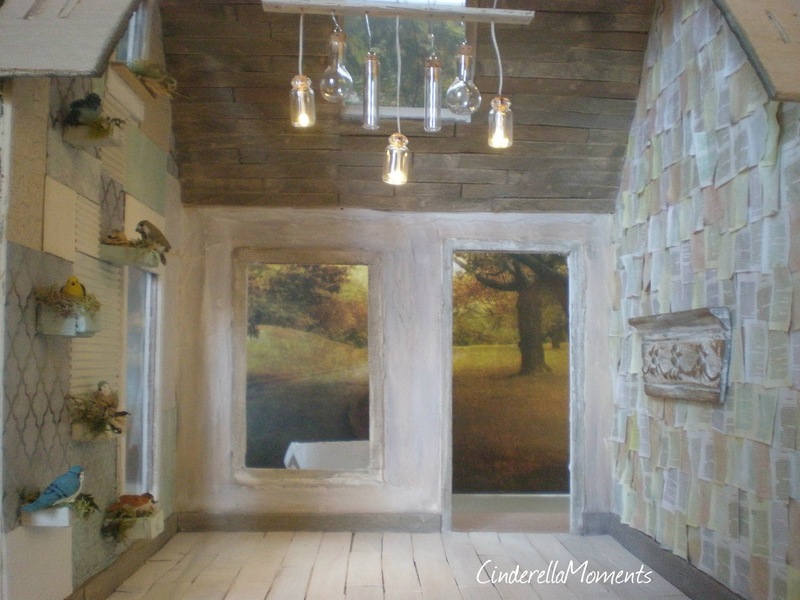 I LOVE the creativity of the decor. I KNOW you're having so much fun. Can't wait to see the rest! 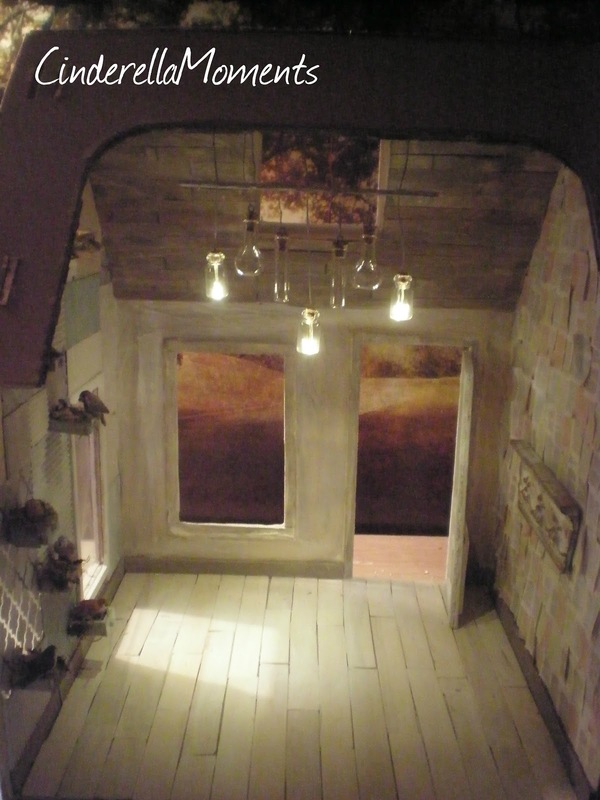 wonderful Dollhouse and the birds are magnificent how did you make it so perfect? I love the book pages wall! How clever! es macht ganz viel Spaß deine tolle Häuschen anzuschauen. Vielen Dank fürs zeigen. 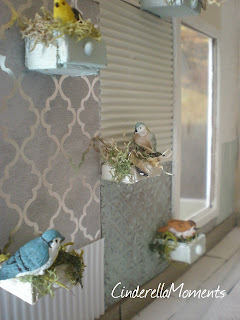 I love those little birds did you make those they are so cute!! !